« From $199,900! Spectacular New WYND Surrey City Centre Condo Tower with Spacious 1 to 3 Bed+Study Floor Plans! Luxurious and elegant, CAMBRIA by MOSAIC Homes is a brand new apartment residence that delivers on every promise for this exciting new Westside address. Situated at Cambie & 50th Street Vancouver CAMBRIA by MOSAIC is the marquee new project in the Oakridge district close to Langara College. Oakridge Centre, Langara Golf Course and the new Canada SkyTrain Line (to downtown or YVR/Richmond) are adjacent to the property as well. The MOSAIC CAMBRIA Vancouver condos are also very close to top rated schools for all ages (both public and private schools), recreational options, Kin’s Farm Market, Peninsula Seafood Restaurant, David’s Tea, Seasons in the Park, Kerrisdale and many boutique shops and services. Featuring a wide array of 1, 2 and 3 bedroom floor plans, the new CAMBRIA Vancouver apartments will be a six storey boutique low-rise building. There will only be 126 suites for sale and it’s about design and location. Every small detail has been taken care of and thought of and the functional and spacious layouts are well designed for today’s home owner. Outside, the new Westside Vancouver CAMBRIA apartment building will feature unique white and detailed brick framing that gives the façade an intimate scale. This is one great selling feature of MOSAIC homes: unique design and architecture that will be ‘in-style’ for generations to come. The evocative metal work over the clean white backdrop also makes for a more modern twist on these traditional materials. Outside, Westside Vancouver CAMBRIA home owners can also enjoy the professionally landscaped grounds that have unique layered landscaping from the grand Cambie Boulevard to rows of mature trees, hedges and grasses to softening garden walls to add curb appeal. MOSAIC Homes has a stellar reputation for designing and building high-class residences in premium locations. 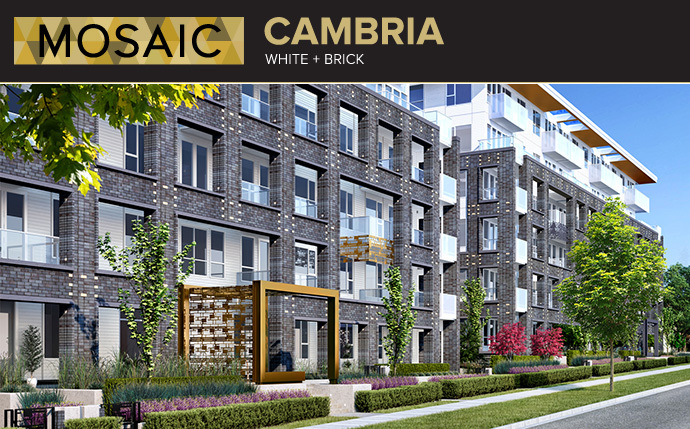 CAMBRIA by MOSAIC is poised to be a dynamic addition to the evolving Oakridge neighbourhood which is going through a major revitalization of its own. 1 bed homes from $349,900 and 2 bed homes from $554,900. The floor plans at CAMBRIA Vancouver Westside apartments range in size between 593 to 1,852 square feet in size and the layouts include everything between 1 to 3 bedroom plus study designs. Some of the expansive outdoor living spaces at CAMBRIA are up to 487 square feet! Affordably priced from the mid $300’s for a Vancouver Westside condo, CAMBRIA by MOSAIC gives you timeless luxury urban living at its best. The sought after Oakridge location is one of the finest in the city and the locale at Cambie and 50th Street Vancouver gets you front and centre within everything that you need to see and do within the city. 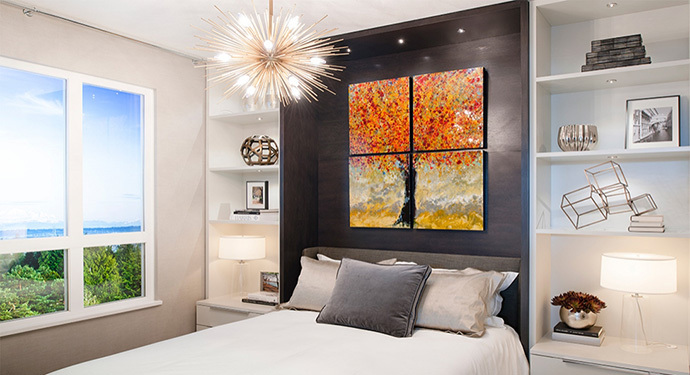 The sales centre for CAMBRIA Vancouver will be opening in late May from noon to 6pm at the southeast corner of Cambie and 41st Street (off-site). More information is online at http://mosaichomes.com/cambria/. Intelligent space and natural light are great features of these new homes at Vancouver’s Westside Oakridge neighbourhood. From extra spacious outdoor living spaces to functional floor plans, the CAMBRIA by MOSAIC homes will feature seven foot high sliding doors with beautiful views out to the mountains and city. The main living areas will feature nine foot high overheight ceilings with dropped featured ceilings in the kitchen. The Westside Vancouver CAMBRIA apartments will also feature loop pile carpets throughout the bedrooms and laminate wood floors in the main living and dining areas. Radiant in floor heating and HRV system are other standout standard features. The kitchens will feature island or peninsula kitchen with plenty of storage space and countertop space. The polished quartz backsplash and countertops are simply stunning and there is a rollover waterfall cable-ends that extend to the floor for that elegant yet modern look. All homes come with undermount Kohler 20 gauge stainless steel double bowl sink and Kohler Purist pullout faucet in addition to soft close doors and drawers and contemporary wood grain cabinets. 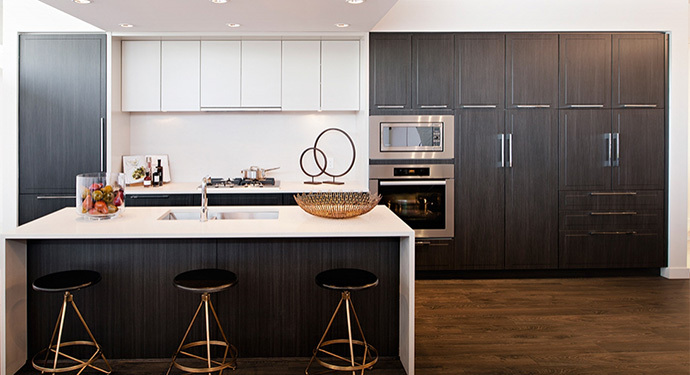 Wall mounted and integrated appliances create a clean and modern aesthetic to the new Vancouver Westside apartments. CAMBRIA by MOSAIC condos also feature integrated pocket office with built-in USB plug to organize and charge devices. 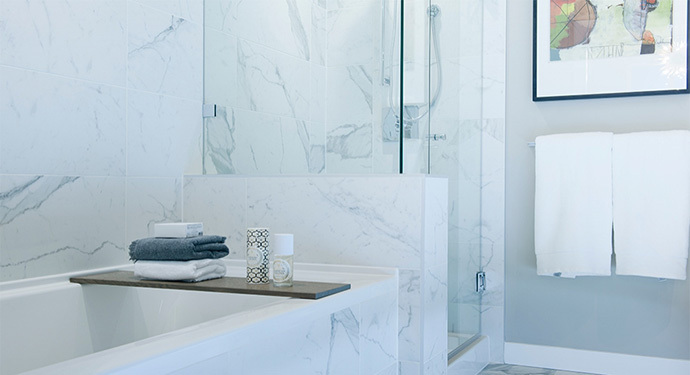 The bathrooms at the new CAMBRIA Vancouver Westside condos will also feature polished quartz countertops and white under mount Kohler porcelain sinks in addition to Kohler single lever Singulier faucets in polished chrome finish. The cabinetry is of contemporary woodgrain with soft closing doors and drawers. The bathrooms will have deep soaker tub in the ensuite baths and Kohler shower heads and bathtub fixtures in polished chrome. The bathrooms also have glazed porcelain tiled bathtub and shower surrounds. The homes at CAMBRIA Vancouver condos will be built to LEED Gold standards and all homes are backed by the Traveler’s 2-5-10 New Home Warranty. The beautiful Gold Collection features at CAMBRIA apartments includes a high-end Fulgor Milano 24”, four burner stainless steel gas cooktop and cabinet finished, integrated Blomberg 24” fridge with three freezer drawers. Other features include a Whirlpool Duet 6.7 cubic foot front laoding stacked washer and dryer in addition to stainless steel wall mounted Panasonic Inverter microwave and stainless steel Fulgor 24” wall oven. There’s also an integrated Blomberg dishwasher with hidden controls and three layers of insulation for extra sound buffering. Last but not least is a Faber Cristal slide out range hood fan that retracts. The beautiful Platinum Collection kitchen finishes include a Miele four burner 30” stainless steel gas cooktop with wok burner and sealed burner for easy cleaning in addition to a Miele slide-out range hood fan that retracts to be flush with the contemporary cabinets. The Platinum Collection CAMBRIA kitchen also features Meile stainless steel 30” wall oven and 30” Fhlaba fridge with cabinet finish/integrated with pull out bottom drawer freezer. Other CAMBRIA Platinum Collection features include a stainless steel Panasonic Inverter microwave and Whirlpool Duet 6.7 cubic foot front loading washer/dryer as well as a cabinet finished, integrated Blomberg dishwasher. Last but not least is the extra Miele under counter wine fridge which is an optional upgrade. + Defined by an iron-grey brick facade, framing a contrasting white interior form. + Sculptural building entries and floating metalwork art provide visual punctuation. + A series of two story facade openings create visual modulation and reinforce the layering concept. 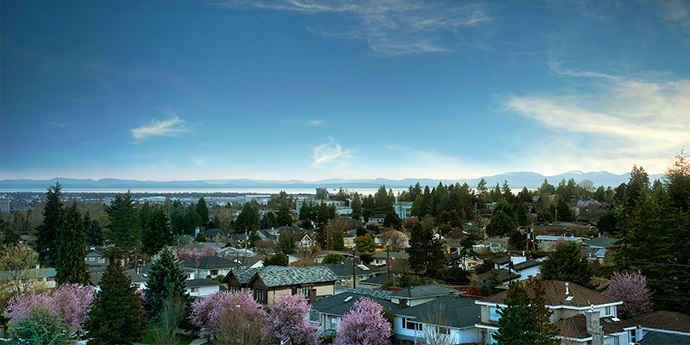 CAMBRIA Vancouver – 1, 2 + 3 bedroom homes available this May. An exciting new offering from MOSAIC Homes is coming soon to the Vancouver Cambie Corridor! Introducing CAMBRIA Vancouver condos, a collection of very stylishly modern one, two and three bedroom apartment residences that feature all the attention to detail and proportion you’ve come to expect from this boutique local builder. 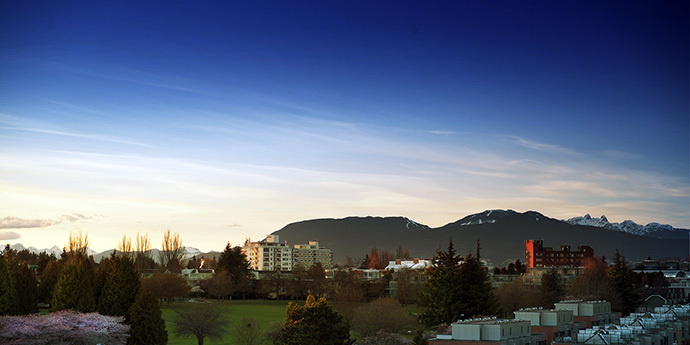 The great location in the heart of the Cambie Corridor at the CAMBRIA Vancouver apartments means that you are just minutes away from the Canada SkyTrain Line, the Langara Golf Course and Langara College. • Portico entries and floating sculptural metalwork punctuate the dramatic masonry screens. • A series of 2-storey openings accentuate the layered design. • Entry lounge lighting accents richly finished wood and tile entry walls. • Distinctive and warming entry accentuated by fireplace and art niches. • Carpeted soft seating area for impromptu meetings and idle times. • Art niches, laminate wood wall panels and dramatic lighting at each floor. • Landscaped terraces and courtyard with garden plots for herbs and vegetables. • A nature-inspired leisure area and outdoor communal courtyard with spaces to sit, play, and gather. Surrounded by trees and grassy commons. • Shared Community Commons with kitchenette, harvest table, and entertainment area. • Bicycle Commons building with dedicated area for bicycle storage, repairs, and efficient access to the many dedicated bike lanes surrounding CAMBRIA. • Bicycle racks in parkade provide secure bike parking while bicycle lockers (optional) provide more enhanced storage. • Brick-clad entry features with welcoming lighting warm the underground parkade entry.